No need to shop around. You're guaranteed the best price when you book with us direct! If you book and pay for a room on our website and later find a lower rate on our site or another site up to 48 hours prior check-in, just let us know and we'll match the price. It’s that simple! Comparison must be to a public website for the same rate plan or special offer under the same conditions including room type, rate plan, offer inclusions, applicable refund and cancellation policy, and dates of hotel stay. 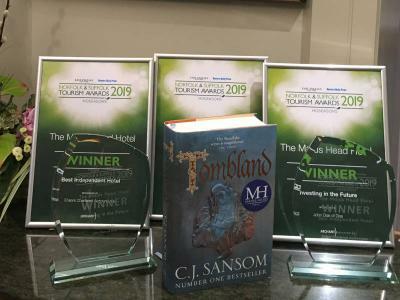 In recognition of the release of 'Tombland', by CJ Sansom, we have developed an exciting new 2 night historic Norwich package. The novel is set in Tudor times and features lawyer Matthew Shardlake, who travels to Norwich and stays at the Maids Head whilst he investigates a gruesome murder.